All four of the top seeds in Section 2AA have bounced around the top 10 in the state Class AA rankings this season, making this a tricky one to handicap. For sure, though, the winner here will be among the favorites to capture the state title once the eight section finalists assemble at the Xcel Energy Center in St. Paul. No. 4 seed Holy Angels (17-7-1) was knocked out of the state's top 10 for much of the season after going 0-3-0 during a deflating Schwan Cup Gold Division appearance in late December. The Stars, however, played an ambitious schedle that included many of the state's elite teams and took them to the East Coast for two games against top Rhode Island and Massachusetts programs (they went 1-1). No. 3 seed Bloomington Jefferson (17-5-3) was ranked as high as No. 2 after a dominating early season run that saw the Jaguars score 42 goals in their first five games. Jefferson is led by senior Caleb Herbert, a UM-Duluth recruit, and one of the state's most dynamic defensemen in Joe Faust, but is still searching for consistency in goal. Talk about a headline writer's dream team, how about No. 2 seed Burnsville (16-6-3), which enters the playoffs on a 10-0-0 roll and a nickname (they are the Blaze) that, given their sizzling run, seems too good to be true. Burnsville is No. 7 in the Hub's final state rankings, the highest the Blaze have been all season. Two games that encapsulated the season for No. 1 seed Edina (17-6-2) were a 7-1 loss to Minnetonka on Jan. 23 followed by a 5-4 overtime win over those very same, and previously unbeaten, Skippers on Feb. 11. The Hornets, ranked No. 6 in the state after being as high as No. 2 for several weeks, can beat anyone. They can lose on any given night as well, and they went 1-4-1 during a late January-early February stretch. No. 5 seed Prior Lake (15-10-0) had a breakout season under first-year coach Joe Pankratz (a former Bloomington Jefferson star) but, like No. 6 Chaska/Chanhassen (9-14-2), isn't quite ready to compete for a section title. For elite level talent, no team in the section can top Bloomington Jefferson. Jaguars forward Caleb Herbert is one of 10 finalists for Mr. Hockey, the annual award given to the state's top senior. Teammate Joe Faust is a two-way defenseman with a booming shot and Division I committment to Princeton. Joining Faust on the Jags' blue line is Jeffrey Pauluk, who tied for sixth in the state in assists with 40. Holy Angels features two Minnesota recruits in seniors Connor Reilly and his twin brother Ryan. They are two of an amazing six Stars players who have scored 20 or more goals. The Reilly's younger brother, Mike, is a standout defenseman built from the same Division I-caliber mold. Burnsville and Edina don't have the star power of Jefferson and Holy Angels, but the Blaze and Hornets have benefitted from deep and balanced lineups that can grind down opponents. 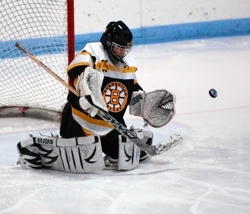 The best player in the section just might be Burnsville goaltender Bodhi Engum (pictured above), a junior who has allowed just two goals in his last four starts. Edina's offense seems to really get rolling if top-end forwards Charlie Taft (16 goals, 10 assists) and Michael Sit (11g, 11a) are producing. Steven Fogarty (18g, 12a) has been the most consistent of the Hornets' top scorers. If the point of the regular season is to be playing your best when the playoffs start, then Burnsville nailed that concept. They get the nod here based on their current 10-game win streak. Throw in the fact the Blaze have a seemingly unbeatable goaltender in Bodhi Engum, and you have the makings of a section champion. As usual, the Stars steamrolled through the Missota Conference en route to a 14-0 league record and another conference title. 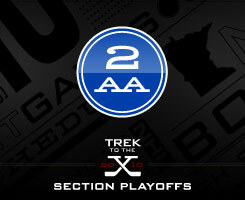 More impressive, though was a 4-2 win over Section 7AA top seed Elk River early in the season and 4-3 triumph over high-powered Benilde-St. Margaret's in the regular season finale. Those wins are strong indicators this is a team capable of making a deep playoff run.